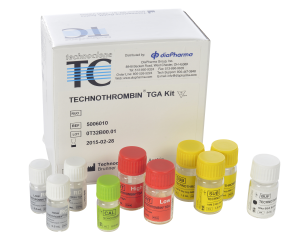 Technothrombin® TGA is a thrombin generation assay (TGA) based on monitoring the formation of thrombin by means of a fluorogenic substrate upon activation of the coagulation cascade by tissue factor. The use of Technothrombin® TGA for such diverse applications is made possible because Technothrombin® TGA allows to measure the whole kinetics of thrombin generation not only during the initiation phase of thrombin formation with the end point fibrin formation, but also during the phase of down regulation of thrombin formation and inactivation of the formed thrombin. 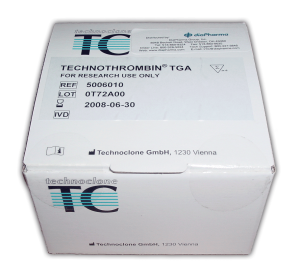 Technothrombin® TGA is therefore a universal tool for analysis and research of the hemostatic system on an individual basis. Control High: 1 x 1 TGA control high (CH) Human plasma with increased thrombin generation, lyophilized. Control Low: 1 x 1 TGA control low (CL) Human plasma with decreased thrombin generation, lyophilized. Each reagent is available separately. 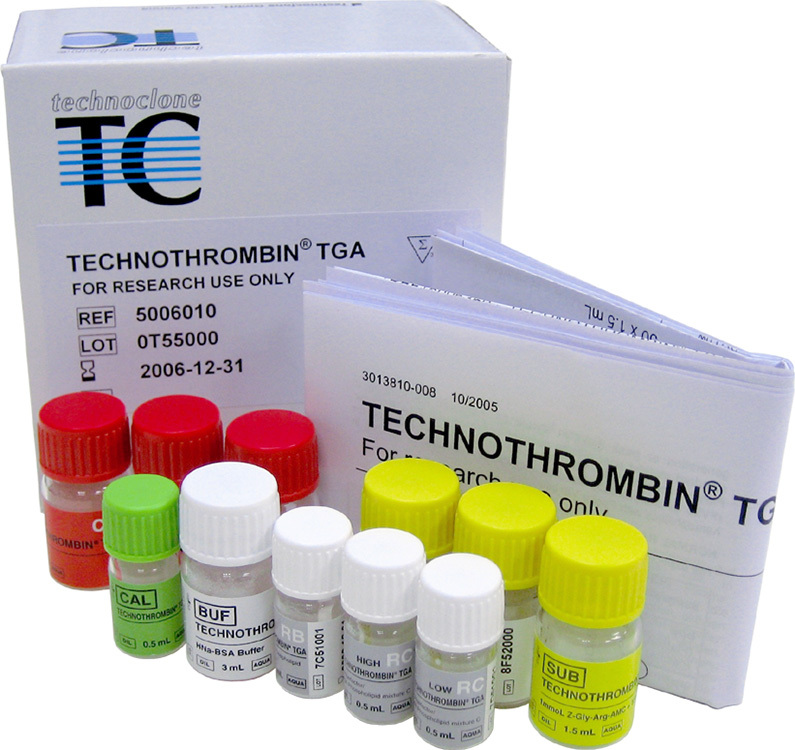 Technothrombin® TGA is based on monitoring the fluorescence generated by thrombin cleavage of a fluorogenic substrate over time upon activation of the coagulation cascade by different concentrations of tissue factor (RA, RB, RC Low and RC High) and negatively charged phospholipids in whole blood or plasma. From the changes in fluorescence over time, the concentration of thrombin (nM) in the sample can be calculated using the respective thrombin calibration curve. The rate of increase in thrombin concentration over time then allows to calculate generation of thrombin in the sample per minute and to plot this value over time for the whole coagulation process. This then results in the visualization of the different phases of clot formation. The Technothrombin® TGA kit is an assay system for determination of thrombin generation over time in platelet poor or platelet rich plasma (PPP or PRP) upon activation of the clotting cascade by micelles of negatively charged phospholipids containing different amounts of human tissue factor and CaCl2. The kit can be used to monitor hemophiliacs during inhibitor bypassing therapy, to monitor anticoagulation therapy, to calculate INR values for patients and to determine states of bleeding disorders or thrombophilia as well as the activity of circulating micro particles. This broad range of applications is possible by providing different tissue factor concentrations and by monitoring the whole kinetic of thrombin generation during initiation, amplification and down regulation of thrombin formation. Technothrombin® TGA is therefore a universal assay kit for analyzing and researching the function of the hemostatic system.